The figure skating anime Yuri!!! on ICE, is still talked about a lot and the collaborations keep on coming. Yuri!!! on Ice is a sports anime television series about figure skating. The anime was produced by MAPPA, directed by Sayo Yamamoto and written by Mitsurō Kubo. Character design was by Tadashi Hiramatsu, and its music was composed by Taro Umebayashi and Taku Matsushiba. The figure skating was choreographed by Kenji Miyamoto, who also performed routines himself which were recorded and used as skating sound effects. The series premiered on October 6, 2016 and ended on December 22, with a total of 12 episodes. A Yuri on Ice feature film is currently in production. 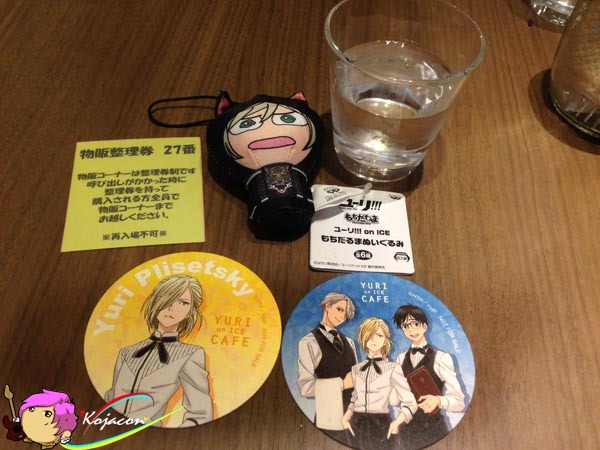 The series revolves around the relationships between Japanese figure skater Yuri Katsuki; his idol, Russian figure-skating champion Victor Nikiforov, and up-and-coming Russian skater Yuri Plisetsky; as Yuri Katsuki and Yuri Plisetsky (later called Yurio) take part in the Figure Skating Grand Prix, with Victor acting as coach to Yuri Released to critical acclaim, Yuri on Ice has been well received in Japan. It won three awards at the Tokyo Anime Award Festival, a Japan Character Award and seven awards in Crunchyroll’s inaugural Anime Awards. A new collaboration cafe open in Omotesando, Tokyo for a limited time. 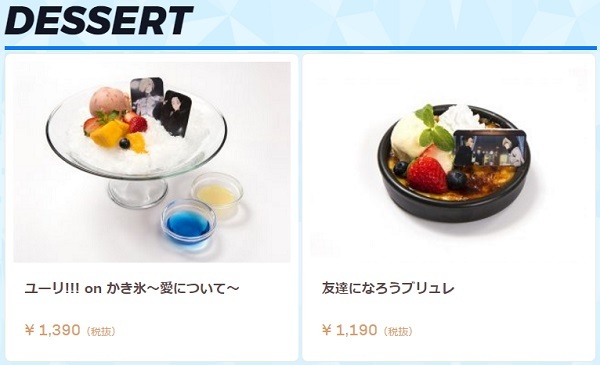 There are also collaboration cafe in Osaka and Nagoya as well. 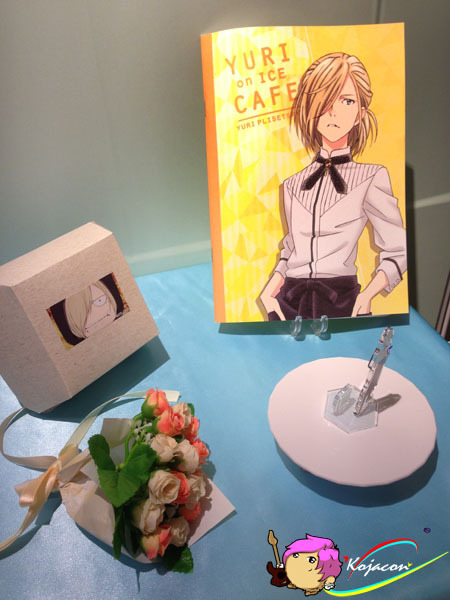 As with any other collaboration cafe, there are many special foods and drinks waiting for the fans, as well as original goods. 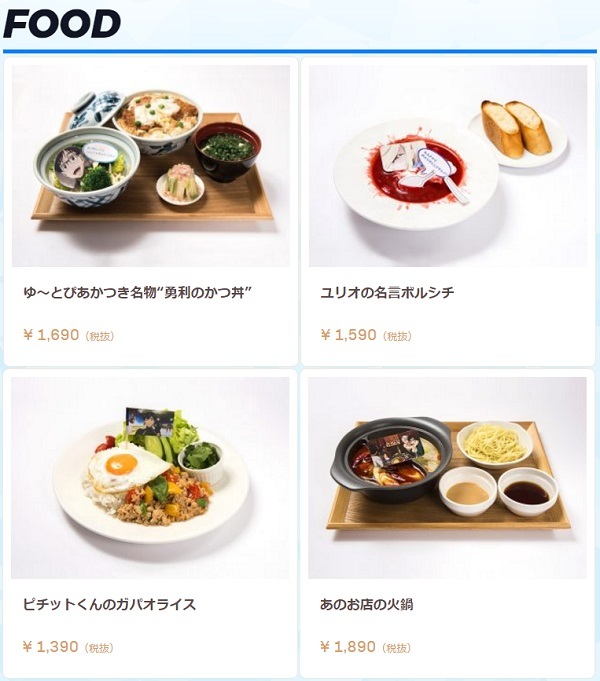 To visit the cafe you’ll need to make a reservation through their official website. They started taking reservations on 19 May 2017 and cost 650 yen, including an A3 poster. The venue is the Omotesando Box Cafe&Space, which is open from 11:00-21:20. 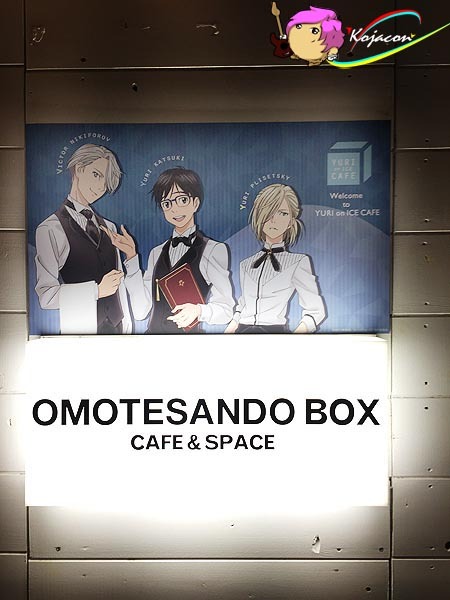 Omotesando Box came together with our favourite figure skating original anime to bring us a special menu. 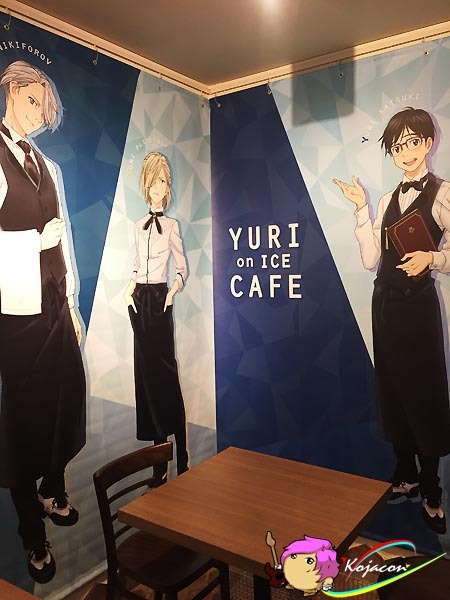 Not only did they have the famous Katsudon that Yuri loves so much, but they even have Yurio’s Katsudon Piroshiki! 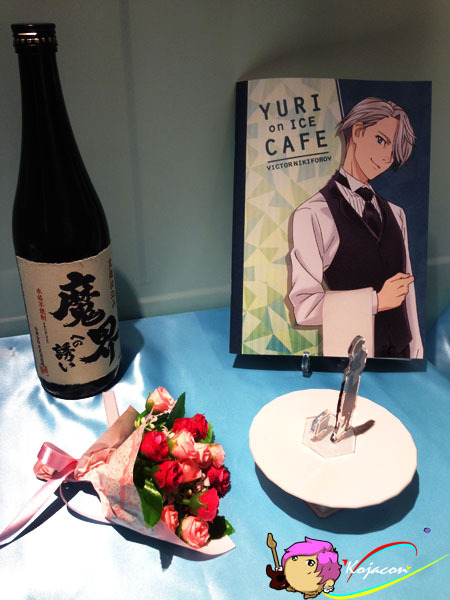 And there were plenty of drinks and desserts inspired by the series too. 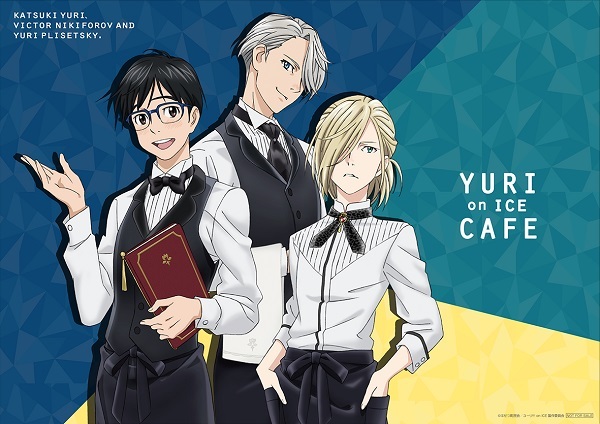 Don’t forget to check out the original illustrations of Yuri, Yurio and Victor, looking good in waiter uniforms! Kojacon Team were visiting Yuri!!! 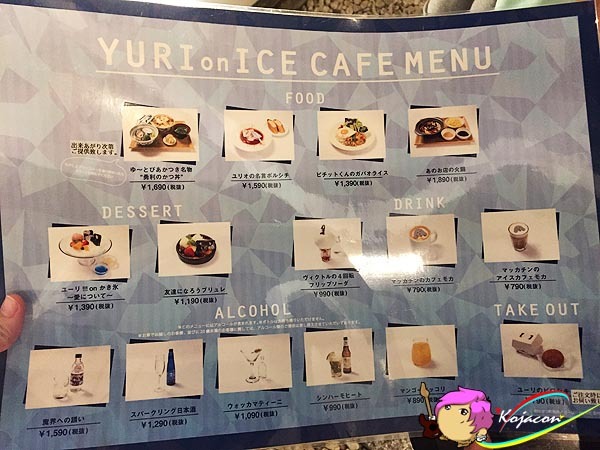 on ICE Cafe in Omotesando last month and ordered some food & beverages. Now we will share to you all the most best seller. 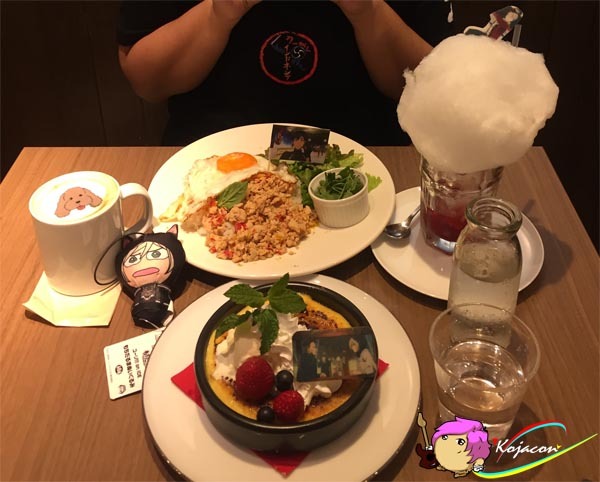 We bought Pichit-Kun no Gapperaise and Tomodachi ni Narou Brulle for food, and for beverages we ordered Victor no 4-kaiten flip soda and Makacchin no Cafe Mocca. 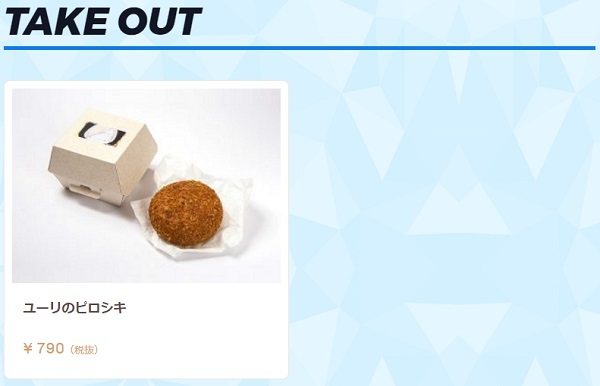 Unfortunately we didn’t get too many merchandise to buy because most of them are sold out already. Hope to find another occasion to visit this kind of collaboration cafe near future! Please enjoy the food and cafe athmosphere here!